In just three weeks, collaborators in the CrossCheck project have investigated 23 suspect stories about the upcoming French election, of which 17 were fakes. Participants, including Le Monde, BuzzFeed, Channel 4, Bloomberg and Agence France-Presse (AFP) have had to hurdle systems and linguistic barriers at speed. They’ve also been parking some traditional newsroom rivalries to pool their verification firepower, says Mark Frankel. But now the team work is starting to pay off - not just in terms of debunks, but in new stories that partner organisations have been able to flesh out. Take last week’s Fake news: Five French election stories debunked on the BBC News website. 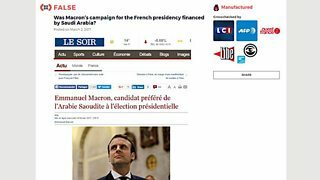 No, Emmanuel Macron’s campaign is not being financed by Saudia Arabia, despite the claim being widely shared and liked on social media. Likewise, French authorities are not about to replace Christian public holidays with Jewish or Muslim holidays (that’s an old idea, recycled by a new think tank). 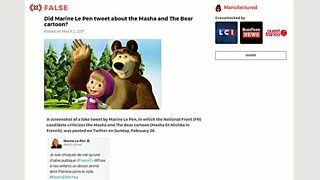 Nor did Marine Le Pen lash out at a children’s cartoon character for wearing a veil - the tweet was a fake. “Our piece was a compendium of news that CrossCheck has investigated. All of these dubious-sounding stories emerged in different ways on the internet and were discussed quite widely online,” Frankel says. All five had previously been dissected on the public CrossCheck blog and have been variously published by other CrossCheck participants. Frankel expects many more debunks and stories with serious health warnings to surface in the run up to the first round of French elections on 23 April. So how is this collaboration of 37 competitive news organisations being made to work? CrossCheck is the latest project from non-profit start-up First Draft News which specialises in verification. It was launched at the end of February, specifically to focus on false, misleading and confusing claims that circulate online about candidates, political parties and other issues relating to the French election. Stories, comments, videos and images are all under scrutiny. Some organisations, like Channel 4, participate in the reporting but not the verification side, he says. Most partners are using the same set of dashboards and verification tools and CrossCheck is actually the name of the project’s shared CMS (content management system), currently used by around 60 journalists. “We have a Slack channel, where information and emerging stories are shared, and we use tools like Newswhip to track audience engagement on a topic. When posts or stories are signposted as possibilities, someone goes into the CrossCheck platform and adds a link, then others weigh in to the conversation. Like other non-French speaking participants, the BBC now has a bilingual intern sitting in the main London newsroom, alongside its UGC team, helping BBC journalists to converse with their French partners and translating material being researched. Of the 23 stories given the CrossCheck treatment so far (at time of writing), eight were judged ‘false’ and completely ‘manufactured’; one was ‘false’ (manipulated); two were ‘false’ (misreported); one was ‘false’ (satire); and five were ‘false’ (misattributed - including the public holidays debunk). Four more earned a ‘caution’ classification - either ‘misleading’ or ‘manufactured’, though with some factual elements. Just one of the 23 was found to be true (about a 36% poll for Macron). And the project’s journalists failed to reach a conclusion on whether National Front supporters in the south of France received violent anonymous threats, as was claimed on Twitter, giving that story an ‘insufficient evidence’ label. In the competitive world of news, the relationship between the partners is a rather “new dynamic”, the BBC man observes: “These are challenging stories that can be very difficult to stand up, so working together gives the whole process a greater sense of urgency. Earlier this year, the BBC established its own permanent Reality Check unit, investigating a constant flow of claims and counter-claims in domestic and international affairs. That operation is set to expand. But for the next couple of months, “a small amount of resource” in BBC News and BBC Monitoring will be dedicated to the French election project, says Frankel, and for the duration of CrossCheck, pieces produced from the collaboration will be published with ‘Reality Check’ branding. In terms of a life for CrossCheck after the French election, First Draft News has ambitions for an ongoing “global newsroom of collaborating journalists on misinformation”. Frankel is concentrating on the task in hand: “It’s still early days for CrossCheck. Imagine the logistics of getting all the software, dashboards and tools up and running and all those journalists trained and up to speed.